Win 2 nights at ANY Hilton hotel worldwide! Hilton is currently running a California Road Trip promotion for anyone planning a trip to the US West Coast. To promote this package, Hilton has given us two ‘Be My Guest’ certificates to give away to one lucky Head for Points reader. The ‘Be My Guest’ vouchers can be used for a free night at ANY Hilton property worldwide – including all the hotels that participate in the California Road Trip promotion! You do NOT need reward availability to be available. You simply book a standard room on a ‘pay at departure’ cash rate and hand over the certificates at checkout. 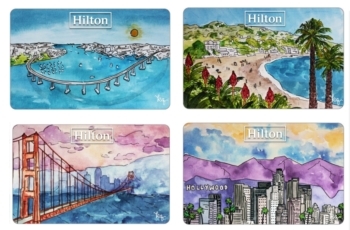 Guests who book the California Road Trip package at participating Hilton hotels in California will receive one of four collectable key cards which unlock experiences in the area. In addition, guests will also get either breakfast or premium wifi included with their package depending on the hotel they are staying at in California. The California Road Trip package can be booked on this Hilton page. You must book by 30th September 2018 and stays have to be completed by 1st October 2018. 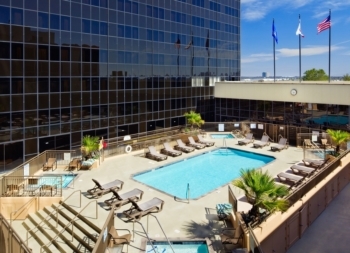 The Hilton LAX is a great place to start or end the California road trip. It’s right next to LAX airport with a free shuttle bus to and from all terminals and has a heated outdoor pool and four whirlpools. Hilton LAX also has an executive floor with lounge as well as four restaurants. The hotel’s entrance area and exterior have recently been freshened up to make guests feel welcomed from the moment they arrive at LAX. The iconic Beverly Hilton is the home to famous award shows like the Golden Globes and a popular location for photo and film shoots. It is close to Rodeo Drive and sights like the Walk of Fame are a 15 minute drive away. Many rooms and suites at the Beverly Hilton offer outdoor living spaces and sweeping views of the Hollywood Hills. We have two ‘Be My Guest’ certificates to give away to one lucky reader. The winner can redeem the ‘Be My Guest’ certificates by booking a standard room for cash at the ‘pay on departure’ rate and then showing the certificate at check in. The certificates can be redeemed at any Hilton Group property worldwide! This means you could stay in California, go budget at the Hampton by Hilton Berlin Alexanderplatz or fully maximise the value at the Conrad Maldives Rangali Island – the choice is yours! You can only enter once per person. The certificates will be issued in the name of the entrant and are not transferable. They are valid for a year from the date of issue. You need to enter by midnight on Sunday 1st July 2018. Entry is open to UK residents only. I’m a UK resident but I am being blocked because I am currently overseas. That does not appear to align with the eligibility rules. Why do we have to do this via a social network? It’s about time I won something, but there should be limits. have to enter via instagram, twitter or something else I don’t use. There is nothing wrong with the competition and it’s Rob that chooses Gleam as the entry software, not Hilton, I am guessing. Simple user error is the issue here, not Hilton. Put your toys back in your pram and figure out how to work Gleam, without a social media account, like the rest of us, or ask for help politely rather than spouting off idle ‘I’m taking my business elsewhere’ remarks. It’s a free competition for goodness sake, most of us are genuinely grateful for the opportunity. Perhaps best you stick to IHG.